Gerhard Peter Regehr: elder (Aeltester) and teacher; born 5 November 1866 in Gnadenthal, Molotschna Mennonite Settlement, South Russia, the eighth of ten children born to his parents, Peter P. Regehr (1828-1913) and Katharina (Schellenberg) Regehr (1827-1887), [see additional information for further details regarding Gerhard’s family]. On 18 May 1894, Gerhard married Maria Siemens (1873-1944) at Reinfeld, Yazykovo Mennonite Settlement, and had seven children. Gerhard died in Los Angeles, California, USA, on 14 March 1960 and was buried in Yarrow, British Columbia, Canada. Following baptism on 17 May 1887, Gerhard joined the Mennonite Brethren (MB) Church. Gerhard’s deep desire for education was realized upon receiving an inheritance following the death of his mother in 1887, and an unexpected early release from his alternative service obligations (Forsteidienst). Within three years, he graduated from the Ohrloff Zentralschule, followed by studies at the Pedagogic Institute in Halbstadt and certification to teach in German and Russian. In 1892, he received a teaching appointment in Reinfeld, where he taught for four years. In 1894, Gerhard married Maria Siemens at the bride’s home on the Reinfeld estate in Yasykovo Mennonite Settlement. Prior to his marriage, Regehr had already been active in preaching. On 27 December 1895, he was ordained as minister by the Einlage Mennonite Brethren Church and in 1903, he was ordained to the position of Elder (Ältester), succeeding Aron Lepp. Gerhard faithfully served in this capacity from 1903 to his immigration to the USA in 1923. The Regehr family moved from Reinfeld to Nikopol in 1915 where, in addition to his church-related responsibilities, Regehr became manager and part-owner of his father-in-law’s flourmill, the J. J. Siemens Mill. The advantageous Nikopol location more easily facilitated his travel to the various churches in the Chortitza Mennonite Settlement under his care. Gerhard Regehr’s devotion to the MB Church and his leadership and influence in the MB Conference were also evident at the joint church conference held in Kharkov, 14-16 September 1918, which he chaired. Later, as chairman of the Nikopol Mennonite Aid Committee, Regehr, in a letter to the Mennonitische Rundschau in 1922, addressed the leadership of the American Mennonite Relief Agency (AMR) and pleaded for help on behalf of the starving people in the Mennonite villages and in Nikopol. Whereas Regehr headed the aid distribution in Nikopol provided by the America Relief Administration (ARA), his son Jacob helped the AMR in a Mennonite village. The Regehrs were determined to emigrate and despite receiving a visa for Germany and a job offer from the mission organization Licht im Osten, they were intent on getting out of Europe. On 1 September 1923, the Gerhard Regehr family, with the assistance of Bishop Aaron Louikes from Pensylvania, was able to immigrate to the United States via Ellis Island, New York. By 17 October 1923, the first of a series of Regehr’s articles, titled “Reisebericht,” appeared in the Zionsbote. 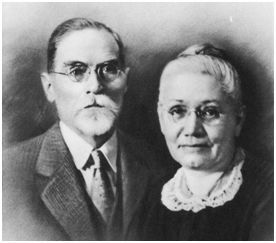 In the USA, the Regehrs spent one year in Lancaster, Pennsylvania and then were invited to the Mountain Lake MB Church in Minnesota, where Gerhard became an itinerant preacher from 1924 to 1930. Their next move was to Minneapolis until 1946 when, after Maria’s death, Gerhard lived with his daughter, Lydia. From 1947 to 1957, Lydia’s work took them to Seattle, Washington, which made it possible for Gerhard to become a member at Yarrow MB Church, attend Communion services, and also occasionally to preach. Their last move was to Los Angeles in 1958. Gerhard Regehr, influential in a period of MB history also remembered for its rigid rules pertaining to things perceived to be worldly, was surprisingly open-minded in a number of instances. In Russia, he granted his pre-teen daughter permission to have her ears pierced for earrings. Also, regarding a more serious issue, Gerhard and Maria, reportedly, did not object to their son Jacob’s marriage to a woman of the Orthodox faith. In 1924, in the Mennonitische Rundshau, Regehr vigorously opposed a writer’s view that a Mennonite pastor should not marry a couple unless they were converted. That “salvation engenders evangelistic zeal” became a motivating force in how Gerhard Regehr lived his life, whether teaching or preaching, ministries dearest to his heart. Endowed with a gentle manner and a non-judgmental spirit, he left a mark on those whose lives he touched. At the time of his death, Gerhard was the last living Mennonite Brethren Elder. Dueck, Mary Regehr. "The Good Stock": Siemens, Peters, Regehr, Korolkov. Abbotsford, BC: Mary Regehr Dueck, 2009. Isaak, Fr. And D. Isaak. “Protokoll der Konferenz . . . 14-16 Sept. 1918, Charkov.” In A. H. Unruh, Die Geschichte der Mennoniten-Bruedergemende: 316-323. Die Mennonitische Rundschau (30 March 1960). Neufeld, Kathryn (Regehr). Memories, 1988. Regehr, Gerhard P. “Etliche Gedanken…wen darf ein Prediger in die Ehe verbinden?” Die Mennonitische Rundshau (2 July 1924): 2, 3. Regehr, Gerhard P. “Reisebericht.” Zionsbote (October 1923-February 1924). Regehr, Jacob G. Etwas von unserer Herkunft und aus unserem Leben. Unpublished. Gerhard was the son of Peter P. Regehr (2 November 1828, Muntau, Molotschna, South Russia - 29 November 1913, Tiegerweide, Molotschna, South Russia) and Katharina (Schellenberg) Regehr (28 May 1827, Rosenort, Molotschna, South Russia - 8 March 1887, Gnadenthal, Molotschna, South Russia). On 18 May 1894, Gerhard married Maria Siemens (23 September 1873, Petersdorf, Yazykovo, South Russia - 6 May 1944, Minneapolis, Minnesota, USA), daughter of Jakob Johann Siemens (28 September 1848 - 26 March 1920, Odessa, South Russia) and Anna Peters (22 November 1853, Petersdorf, Yazykovo, South Russia - 9 September 1932, Hochfeld, Manitoba, Canada). Maria was buried in Winnipeg, Manitoba. Gerhard and Maria had seven children: Jacob, Maria, Anna (died young), Gerhard, Henry, Lydia, and Kathryn. Dueck, Mary Regehr. "Regehr, Gerhard P. (1866-1960)." Global Anabaptist Mennonite Encyclopedia Online. November 2010. Web. 25 Apr 2019. http://gameo.org/index.php?title=Regehr,_Gerhard_P._(1866-1960)&oldid=120775. Dueck, Mary Regehr. (November 2010). Regehr, Gerhard P. (1866-1960). Global Anabaptist Mennonite Encyclopedia Online. Retrieved 25 April 2019, from http://gameo.org/index.php?title=Regehr,_Gerhard_P._(1866-1960)&oldid=120775. This page was last modified on 13 April 2014, at 20:40.